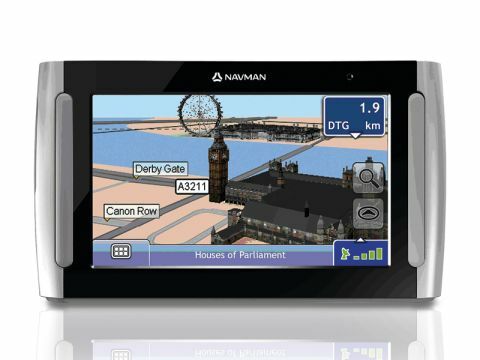 The Navman S30 3D is aimed at the first-time sat nav user. To this end, you'll find a simple interface, a no-frills approach to navigation and, best of all, a great value package. The plastic used looks a little cheap, but proves robust. The display is a 3.5-inch touchscreen with a 320 x 240-pixel resolution, but as it's framed by a large black and silver bezel, it doesn't really stand out, especially when compared to the Garmin nüvi. Switch the device on and the interface is sharp and easy to navigate. We found the GPS tracked sufficient satellites in a reasonable time, and even maintained a strong signal indoors. The maps support 2D and 3D mapping and the voice directions are loud and clear. Being an entry-level device, you won't find any form of expansion, but you can update the maps for the UK and Ireland when synchronised with your laptop. Market leader Tele Atlas supplies the maps, so you'll find the usual Points Of Interest (POI), as well as petrol stations and other everyday necessities. There is also a free trial of safety camera data supplied. Once charged, you can use the S30 in the car or on foot. Navman claims the battery will last for up to 3.5 hours in standard usage, which we found was a little optimistic. However, you'll easily get over two hours from the device before needing to recharge. Along with the device itself, you get a charger and in-car docking cradle, adding great value. While the S30 is very much an entry-level model compared to the Garmin nüvi and TomTom XL Traffic Europe, it still manages to deliver a service that will get you from A to B with the minimum of fuss.